Pretty young woman in a stylish look texts the message by her phone and smiles while sitting in a café. Having fun, positive emotions. Being happy. Modern life, modern style. Stylish hipster girl with red lips using her phone in a cozy café, gets the message, looks disappointed, texts back. Modern life, social networks. Outdoor activity. Female portrait, light makeup. Beautiful stylish young woman in a rush walks to the business centre, and uses her phone, gets the message, is surprised, jumps happily. Good news. Positive emotions, happy moments. Pretty young girl in a stylish look sits by the window in the café, enjoys tasty hot coffee, surfs the internet, texts back the messages and smiles happily. Weekend, having fun. Extremely glad young woman in a stylish sweater sits in the café, drinks coffee, texts the messages and smiles happily. Cheerful mood, being happy. Having fun, daily routine. Pretty young woman in a stylish sweater sits in the café, drinks coffee, texts the messages and smiles happily. Cheerful mood, being happy. Having fun, daily routine. Pretty young woman uses her phone, texts back while sitting in the café. Positive emotions, cozy atmosphere. Pretty young woman in a stylish sweater sits in the café, drinks coffee, texts the messages with her tablet and smiles happily. Cheerful mood, being happy. Having fun, daily routine. Hot blonde woman in casual outfit standing outside the café by her bicycle and happily, seductively eating ice cream. Enjoying the desert, positive emotions, cheerful mood. Being happy. 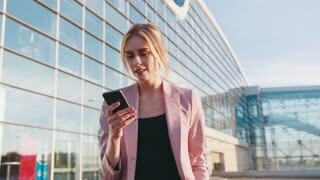 Pretty young business woman in formal outfit walking by the airport, and using her smartphone. Modern lifestyle, blogger, positive emotions. Adorable toddler-boy stands in the middle of high-grass, holds the smartphone, being a young blogger. Positive emotions. Having fun, modern children, being online.